The Shopsmith Power Coupler is made of a virtually unbreakable plastic compound. Each end mates with splined metal Hubs that attach to your Mark 7 or Mark V and special purpose tools. Why not order two for the same postage and get a discount? The Shopsmith Power Coupler is made of a virtually unbreakable plastic compound. Each end mates with splined metal Hubs that attach to your Mark 7 or Mark V and special purpose tools. Additional machine drive hubs can also be purchased individually for each Shopsmith special purpose tool. Order a complete coupler kit and/or extra machine drive hubs for the swiftest machine changeovers. The power coupling kit includes the coupler and 2 metal hubs (one each for the upper and lower spindles of your Mark 7 / Mark V). Note: The coupler kit comes standard with all Mark 7 / Mark V's manufactured after April, 1985. 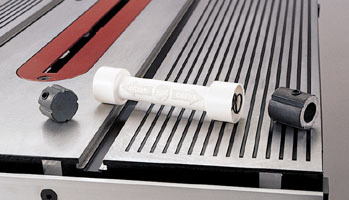 It is required to connect Special Purpose Tools (SPT's) to your Shopsmith.